Despite the fact that a demonstration of a causal role for temporomandibular disorder (TMD) has not yet been found and doubts exist as to the etiology of both awake and sleep bruxism, many, treatment alternatives have been proposed in the literature. The treatments evaluated are as follows: sleep hygiene measures combined with relaxation methods, splint therapy, drug therapy, and reliant electrical stimulation.,,, Patients often favor conservative treatments such as physiotherapy, psychosocial intervention, and splinting, which are noninvasive, painless, and economical, but they require good acquiescence to be effective. Drug treatment is more effective and necessitates less compliance than conservative treatments and also well accepted by the patients. However, it requires an acceptable level of health and is sometimes restricted because the drug is contraindicated. Botulism was originally called “sausage poisoning” because it occurred after ingestion of poorly prepared blood sausage. Botulinum toxin (BTX) has been under the clinical search since the late 1970s for the management of several situations allied with extreme muscle contraction or pain. Furthermore, it is the first-choice treatment for wrinkles located on the upper third of the face, BTX is also widely used in the prevention and correction of changes caused by muscle contraction in the middle and lower thirds of the face and neck, including bruxism.,, Clostridium botulinum was first identified in 1897, in Belgium, by Professor Emile van Ermengem. In the same year, an antiserum for botulism was made. Justinus Kerner (1786–1862) was the first to describe the features of botulism. The occlusion analysis system is a computer-assisted device partaking a pressure sensor. It was urbanized in 1984 to assess occlusal forces and contact times and is measured a prosthodontic adjunct specific to problems that advance during the treatment of occlusal disorders and bruxism. Koos et al. presented that it was both precise and stable, and neither changing the foil, nor repeated measurements had an appreciable influence on the measured value. To date, we know of few studies that have described the outcome of injection of botulinum toxin type A (BTX-A) into the masseter and temporalis muscle for reducing the myofascial pain in bruxism, and the occlusal force characteristics in bruxism have not to our knowledge been investigated. Twenty-four patients (age range 20–35) with a clinical diagnosis of bruxism and myofascial pain of the masticatory muscles were registered at the Department of Maxillo-Facial Surgery, Government Medical College at Akola and Dr. Hedgewar Smruti Rugna Sewa Mandal Dental College and Hospital, Hingoli, Maharashtra, India. The presence of bruxism was diagnosed using a confirmed set of screening-oriented clinical diagnostic criteria, so that in the present study, bruxism is expressed only in terms of its clinical impact on the masticatory apparatus and not as a more complex pathophysiological disorder distressing the central nervous system.,, Diagnosis of bruxism was made when the patient exhibited, at least five nights a week, grinding/bruxing sounds during sleep for the past 6 months, as reported by his/her bed partner, and at least one of the following adjunctive criteria: remark of tooth wear or shiny spots on restorations; masseteric hypertrophy on digital palpation, evidence of morning masticatory muscle fatigue or pain. Patients with heart disease, mental illness, any systemic disorder, history of any treatment for bruxism and/or TMD during 6 months before the study; the incidence of neuromuscular pathologies, hypersensibility to botulinum type A neurotoxin and other diseases that might cause imbalance of the joint were excluded from the study. All participants gave both verbal and written informed consent. Ethical approval was obtained before the trial from the Ethics Committee of Government Medical College at Akola and Dr. Hedgewar Smruti Rugna Sewa Mandal Dental College and Hospital Hingoli, Maharashtra, India (No. 2016-975-34). The design of the study provided a double-blind, controlled placebo, randomized clinical trial. Patients were randomized into three treatment groups: BTX-A, placebo, and control (n = 8 in each) Group 1 BTX where eight subjects treated with BTX-A injections, Group II placebo where eight subjects treated with saline placebo injections and a control group where no injections were given. The treatment protocol provided four BTX-A (Botox, Allergan, Inc., Irivine, CA, USA) intramuscular injections for each side (30 U) within the masseter muscles and three injections (20 U) within the anterior temporalis muscles, for a treatment total of 100 U. In the placebo group, isotonic saline was injected into muscles in the same way. The control group had no injections. The injections were made during a single appointment under ultrasonographic control. All injections were performed by the maxillofacial surgeon. We used an I-Motion occlusal force analyzer (version 3.2.0 Analysis System, Canonsburg, PA, USA). All the tests were done between 10 00 and 11 00, with the room temperature at 22°C–24°C. Patients were seated with the head and neck relaxed, and the Frankfort plane parallel to the floor. The sensor foil was placed on the mandibular occlusal surface. The patient was asked to clench the teeth for 2 s and release. This movement was repeated five times. Symptoms: Pain at rest and at chewing (VAS values 0, no pain; 1, mild pain, 2, moderate pain; 3, severe pain; 4, tolerable severe pain; 5, tolerable very severe pain). To control for the differences between groups in baseline values, differences between the baseline and the three follow-up values for the outcome variables were considered for statistical analysis. Duration of clenching and releasing, the maximum occlusal force, and the distribution of occlusal force were recorded. The asymmetry index of occlusal force (AOF, %) =100 × (maximum occlusal force of left side − maximum occlusal force of right side)/total maximum occlusal force. All patients enrolled were treated by specialist doctors, and data were collected by another oral surgeon. Data were analyzed using SAS 5.0 software (SAS Inc., SAS Institute, NC, USA). Differences in maximum occlusal force, change in maximum occlusal force, and symmetrical distribution analyses among the three treatment groups were compared using the multivariate analysis of variance and post hoc Bonferroni test to assess the significance of differences between individual pairs of groups. Because the exact P value was not provided by the post hoc Bonferroni test, we did a polynomial comparison test to calculate it. The significance of differences in the duration of contact and separation, maximum occlusal force, change in maximum occlusal force, and symmetrical distribution of occlusal force was assessed using Student's t-test. Descriptive analysis performed on the original clinical outcome variables and on the variables defined as differences are reported in [Table 1] and [Table 2]. 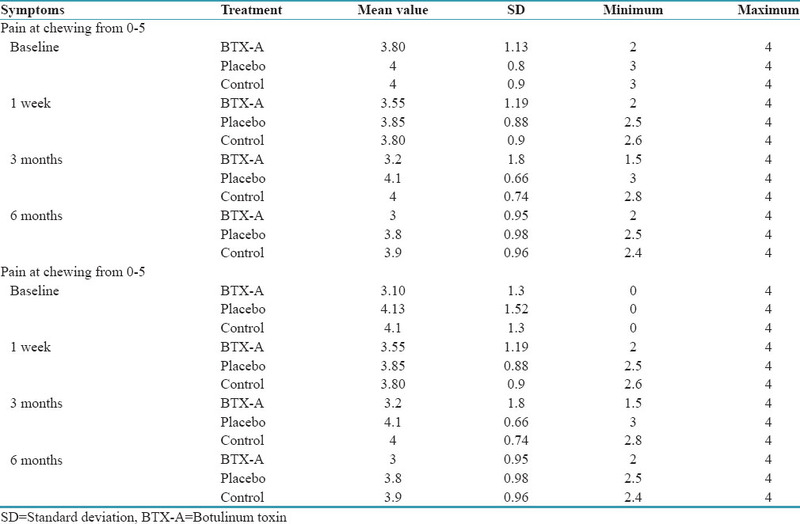 As for symptoms, pain at rest and at chewing decreased in the BTX-A group while remaining constant in the placebo group and control group [Table 1]. Clenching time was significantly increased in the BTX-A group after 3 months, and decreased after 6 months, but there was no significant change in relaxing time. There were no significant changes in either the placebo or the control groups. There was a significant change in maximum occlusal force in the BTX-A group compared with the other two groups (P < 0.05, post hoc Bonferroni test, no exact P value), and there was no significant difference between the placebo and control groups (post hoc Bonferroni test, no exact P value) [Table 2]. To be specific, the polynomial comparison test showed that there were significant changes between the BTX-A and placebo group and the control group and that between the BTX-A and placebo groups was significant. Only the BTX-A group showed a significant time-dependent change in the maximum occlusal force, which decreased to its lowest level 3 months after treatment. The value 6 months after treatment was lower than the pretreatment value, but the difference was not significant. The most commonly used treatment modality for the management of bruxism is conservative symptomatic therapeutic modalities such as behavioral and physical treatments, sleep hygiene measures combined with relaxation methods, occlusal splint therapy, pharmacological management, reliant electrical stimulation, and physiotherapy. However, the treatment modalities such as occlusal splint is mainly aimed to prevent wear of tooth surface and periodontal damage, rather than achieve a therapeutic effect. Chronic local muscular contracture has been known to cause inflammation and localized muscular hypoxia leading to chronic myofascial pain. Considering these premises, the study hypothesis was that BTX may represent an alternate and effective option to avoid prolonged treatment with occlusal splints and/or drugs., BTX-A has been under the clinical pursuit since the late 1970s for the managing of several situations allied with extreme muscle contraction or pain. BTX-A hinder the exocytotic discharge of acetylcholine in the motor nerve terminals leading to abridged muscle contraction. This property makes it useful both clinically and therapeutically for a series of conditions where there is an excess of muscle contraction. Psychosomatic aspects are important in the etiology of bruxism, and so psychological intercession is an intrinsic part of the treatment of bruxism. The change in bite force in the placebo and control groups shows that psychological intervention plays a part in the treatment of bruxism. Kim et al. indicated clearly that bruxism and TMDs are closely related to psychological factors. In an investigation into the treatment of nerve disorders (such as TMD and bruxism), investigator has pointed out that psychological interference can perceptibly release the pain caused by nerve dysfunction., All the present clinical treatments can, therefore, be measured to be a combination of that particular treatment and psychological intervention, which marks patients during their treatment. The present study studied the efficacy of BTX-A to reduce myofascial pain symptoms, even though differences with the placebo and control group were not significant. Descriptive analysis showed that enhancements in subjective (pain at rest; pain at chewing) outcome parameters were higher in the BTX-A group than in the placebo and control patients. The patients treated with BTX-A had higher subjective improvement with time in achieving the treatment outcome than placebo and control group. The present study also showed that all three groups had decreased occlusal force at the intercuspid position, though to different extents, the efficacy of BTX-A was superior and there were no differences between the placebo and control groups. The present study had some limitations such as the small sample size obviously limits simplification of results, even though one must be conscious that some differences in efficacy between BTX-A and placebo might have been strongly significant for larger samples. It is likely that the duration of treatment was too short to show the strong significant difference. Further studies needed to carry out psychological analysis for the psychological interface on the treatment of bruxers. The present findings suggest an employment of BTX-A was effective for treatment of bruxism to reduce myofascial pain symptoms in bruxers. We also achieve that the occlusal analysis system precisely imitates the characteristics of occlusal force during treatment of bruxism. BTX-A has obvious advantages for the treatment of bruxism in terms of tumbling the occlusal force. Paesani DA. Bruxism: Theory and Practice. Berlin: Quintessence Publishing Co., Inc.; 2010. Paesani DA. Bruxism: Theory and Practice. Oxford: Quintessence; 2010. p. 31. De Laat A, Macaluso GM. Sleep bruxism as a motor disorder. Mov Disord 2002;17 Suppl 2:S67-9. Machado E, Dal-Fabbro C, Cunali PA, Kaizer OB. Prevalence of sleep bruxism in children: A systematic review. Dental Press J Orthod 2014;19:54-61. Zhang LD, Liu Q, Zou DR, Yu LF. Occlusal force characteristics of masseteric muscles after intramuscular injection of botulinum toxin A (BTX – A) for treatment of temporomandibular disorder. Br J Oral Maxillofac Surg 2016;54:736-40. Lobbezoo F, Lavigne GJ. Do bruxism and temporomandibular disorders have a cause-and-effect relationship? J Orofac Pain 1997;11:15-23. Lavigne GJ, Kato T, Kolta A, Sessle BJ. Neurobiological mechanisms involved in sleep bruxism. Crit Rev Oral Biol Med 2003;14:30-46. Manfredini D, Landi N, Romagnoli M, Cantini E, Bosco M. Etiopathogenesis of parafunctional habits of the stomatognathic system. Minerva Stomatol 2003;52:339-49. Erbguth FJ, Naumann M. Historical aspects of botulinum toxin: Justinus Kerner (1786-1862) and the “sausage poison”. Neurology 1999;53:1850-3. Chen S. Clinical uses of botulinum neurotoxins: Current indications, limitations and future developments. Toxins (Basel) 2012;4:913-39. Song JH, Cho ES, Kim ST, Ahn HJ. Change of distribution and timing of bite force after botulinum toxin type A injection evaluated by a computerized occlusion analysis system. Yonsei Med J 2014;55:1123-9. Koos B, Godt A, Schille C, Göz G. Precision of an instrumentation-based method of analyzing occlusion and its resulting distribution of forces in the dental arch. J Orofac Orthop 2010;71:403-10. Guarda-Nardini L, Manfredini D, Salamone M, Salmaso L, Tonello S, Ferronato G. Efficacy of botulinum toxin in treating myofascial pain in bruxers: A controlled placebo pilot study. Cranio 2008;26:126-35. Pidcock FS, Wise JM, Christensen JR. Treatment of severe post-traumatic bruxism with botulinum toxin-A: Case report. J Oral Maxillofac Surg 2002;60:115-7. Kim YK, Kim SG, Im JH, Yun PY. Clinical survey of the patients with temporomandibular joint disorders, using Research Diagnostic Criteria (Axis II) for TMD: Preliminary study. J Craniomaxillofac Surg 2012;40:366-72. Roldán-Barraza C, Janko S, Villanueva J, Araya I, Lauer HC. A systematic review and meta-analysis of usual treatment versus psychosocial interventions in the treatment of myofascial temporomandibular disorder pain. J Oral Facial Pain Headache 2014;28:205-22.